I was asked by an acquaintance to emblazon their family coat of arms as engraved on the family silver. 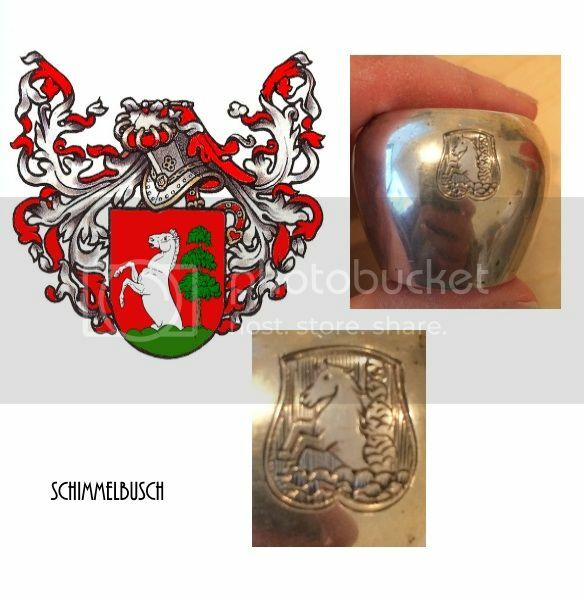 The family is Schimmelbusch and 5they trace their descent directly from Johann Abraham Schimmelbusch, a noted sword maker, born in 1781 in Wald Solingen, Rhineland, Prussia. The hatching of the Field is vertical lines ( Gules) the horse is Argent (a schimmel is a white horse) and the busch (bush) is clearly green. On the silver there is no indication of a crest and I am hoping that a member may have a German armorial with a clue. My emblazonment of these arms, in the Germanic style, is shown with the engraved silver. Is it possible that the crest was a generic panache of five feathers in a combination of Argent, Gules and Vert (all three or two out of the three)? Could be. I'm more inclined, until more information is available, to suggest the ubiquitous eagle wings adorsed in argent and gules. Nothing to do with the heraldry, but in 1781 I believe Solingen was within the Duchy of Berg. Berg became part of the newly formed Rhine Province of Prussia in 1815. A notice in volume 1 (1900) of the German periodical Archiv fuer Stamm- und Wappenkunde (Archive for Genealogical and Armorial Studies), lists a family named Schimmelbusch among the burger families whose family trees and arms were included in Genealogisches Handbuch buergerlicher Familien, published by W. T. Bruers Verlag, Berlin. The latter is a multi-volume work, and I don't know which volume Schimmelbusch is in. It appears that the main entry for Schimmelbusch from Solingen is in volume 5, starting at page 309, but in the only online edition I could find that page is missing (it goes right from 307 to 310), and the arms seem to be on the first page of each entry. I was able to locate a digital copy of DGB vol 5 on archive.org, but unfortunately the article on Schimmelbusch does not show or (as far as I could find) describe any arms. Thanks so much for trying. I tried, without success, to locate the actual volumes on line without success, only references.